It is with great sadness that I'm writing to tell you of our loss of Annie, our much beloved Boston Terrier. Annie was bitten by a rattlesnake this morning, and while we were leaving for the vet, quietly and gently succumbed to the venom while being held in Fiona's arms. 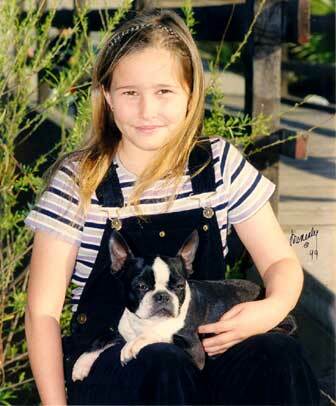 Annie was bred, finished, and trained by Bruce and Sandy Crook of Brandy Bostons and USAgility. Annie finished her Championship on her first birthday with 4 majors. In the ring, and for the rest of her life, Annie was known for the darling way she would prick her natural ears and tilt her head to the side when she was trying to manipulate you into doing something for her. Annie was so protective and possessive of Fiona that, for the first year she was with us, every morning she would come at me barking, stiff-legged and threatening, offering to rip me limb from limb if I came near HER baby. (This was a 12 pound dog) While eventually accepting my presence in my daughter's life, Annie continued her fierce protectiveness of Fiona, and would mourn for her whenever Fiona was hospitalized. Those of you who know Bruce and Sandy know their Bostons are not just cute little dogs. Brandy Bostons are tough little working dogs, and were first to earn Agility Excellent and Flyball Masters titles in the breed. While Annie was a wonderful pet, companion, and agility dog, her ferocious protection of Fiona led to one of our running jokes about Annie—it is that we were going to get busy training so she could be the first Schutzhund titled Boston. Annie was the mother of several Brandy Bostons, including Brandy's Calamity Jane, MX, MXJ, EAC, O-EGC, EJC, AAD, TG-N, TN-O "Janie" (aka Porky-Linkie). She is also the foster mother of our Dobes, Secret and Zen. While Dali is the Dobes' biological mother, when these two came home to our house from Vic and Angie's, Annie taught them the important business of being dogs (and lesson #1 was that a Boston is NOT a puppy, and HAS teeth.) Annie's Dobe children, who grew to be about 7-8 times her size, remained obedient to their "mother," and always mindful that the first syllable of Boston is BOSS. Some of the happiest moments of Annie's life with us were spent with Fiona and our rescue min-pin, Ernie. For the past year, Annie had another little dog to run with, and it's been double trouble. The two of them were very mischievous, but could get away with ANYTHING because upon being caught they would assume their little innocent facial expressions and make you laugh. This morning Secret and Zen woke me up. Annie had been bitten. We moved quickly for help, but a 12 pound dog isn't a match for a rattlesnake. The bite was on her muzzle, as if she had been biting the snake (or at least trying to). Annie was been an important part of our family, and we will always miss her. Secret and Dali are also quite distressed at her loss. We are grateful to God and to Bruce and Sandy for sharing her with us. We will always carry a bit of her tenacious little terrier temperament with us, and miss her deeply.